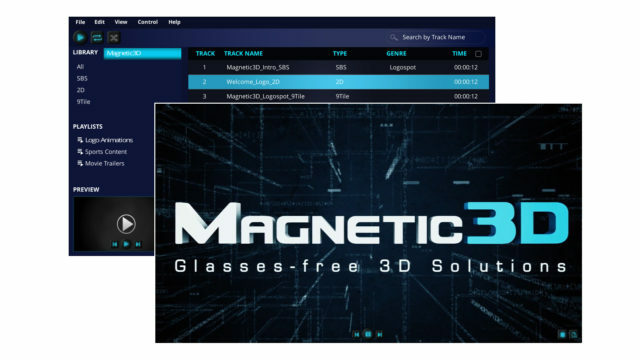 Unleash the power of glasses-free 3D with new applications for viewing and creating 3D content. With an extensive list of content format options available, playback is streamlined Our content creation platform directly supports Cinema 4D and Adobe After Effects, allowing broad latitude for the optimization of 3D models while significantly reducing render times. Create and edit playlists to organize your content for any situation. While editing your playlists, you can preview videos in the preview window without having to play the video in full screen mode. The software is easy to use so you can get your content playing as soon as possible. Load and play your 4K videos smoothly. Create your own 3D content using the Magnetic 3D camera rig within Cinema 4D. Use this workflow to easily create and render content in glasses-free 3D formats. Choose from different preset lens sizes for the 3D camera rig. Each preset has flat planes that act as the boundaries to keep your content inside of. This ensures the optimal 3D effect for your animation. If you already work in Cinema 4D, using this plugin is very straightforward. Quickly render a preview frame in our glasses-free 3D format to instantly see the 3D image on a display.